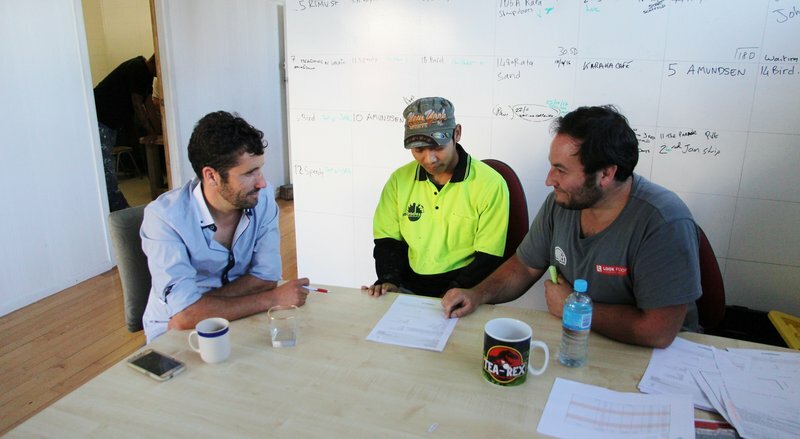 A Wellington-based business has managed to fill a skills shortage thanks to a connection with New Zealand Red Cross. It’s a busy day at the Solutrade headquarters in Wellington. The office is humming as staff come and go, phones ring, and coffee is brewed. The property maintenance business has been booming lately. While that has been great for the books, it’s caused a bit of a headache for the director, Ben Petit. In mid-2016, Mr Petit was struggling to find skilled employees to meet growing demand for their services. It was around this time that he voiced his desire to find a way to support refugee resettlement to Housing New Zealand, one of his clients. They connected Mr Petit with Red Cross Pathways to Employment in Wellington and Solutrades has since employed five people through the programme. Solutrades director, Ben Petit, Pa Uk, and flooring manager Callum Lord in their morning meeting. Pa Uk was the first person to become part of the company through Red Cross, joining their flooring team six months ago. Mr Uk is originally from Myanmar where he was a farmer, so working in the flooring trade was a bit of a career change. “The training is excellent so it wasn’t hard to adjust,” he says. The flooring manager, Callum Lord, certainly seems impressed with the progress Mr Uk has made. “It can take up to two years for most people to learn how to lay carpet and vinyl to a trade standard,” he says. The business certainly seems to present plenty of opportunities for career progression with an expansion underway and offices in Christchurch. “We will invest in training for the right people and we have a number of staff referred through Red Cross who are working out very well, if we put time into the right people then we definitely get it back,” Mr Petit says. It isn’t just dedicated and talented employees he gets out of the relationship with Pathways to Employment though.